Morning friends! Today we're talking sizing and PDF printing, assembling and tracing - bringing us one step closer to cutting out our lovely Dakotas. Although Named patterns are available in 8 sizes, you can only buy them in two sizes at a time. Admittedly, this is tricky if your measurements span over a number of sizes, but it saves heaps of time when it comes to printing and tracing off. The good news is that the Dakota Dress isn't close fitting through the waist - you cinch it in with a belt instead - so I recommend choosing your size according to your bust measurement. Once you get the bust right, the waist and hips are relatively easy to adjust. At this point, it would be great if you could also print off this pattern piece for a sleeve placket, because Rachel will be using the Threads Magazine method for this part of the sewalong. It's just one page and you print it in exactly the same way as above. Because Named patterns only come in two sizes at a time, there's only 15 pages to print off for your Dakota Dress – not bad for a long-sleeved dress eh!?! Each bottom right hand corner is labelled and numbered, making assembly super easy. Also, if you cut off one long and one short border of each sheet (the same sides for each sheet) the process will be much faster too. I found it easiest taping all my horizontal sheets first – these are made up of three sheets each and a total of five rows – then I taped the rows together and voila! You'll notice that your Dakota pattern pieces are overlapped, very much like Burdastyle patterns are presented. This is terrible news for someone like me who'll avoid tracing at all costs, but let's keep positive and remember how fast printing and assembling this baby was! 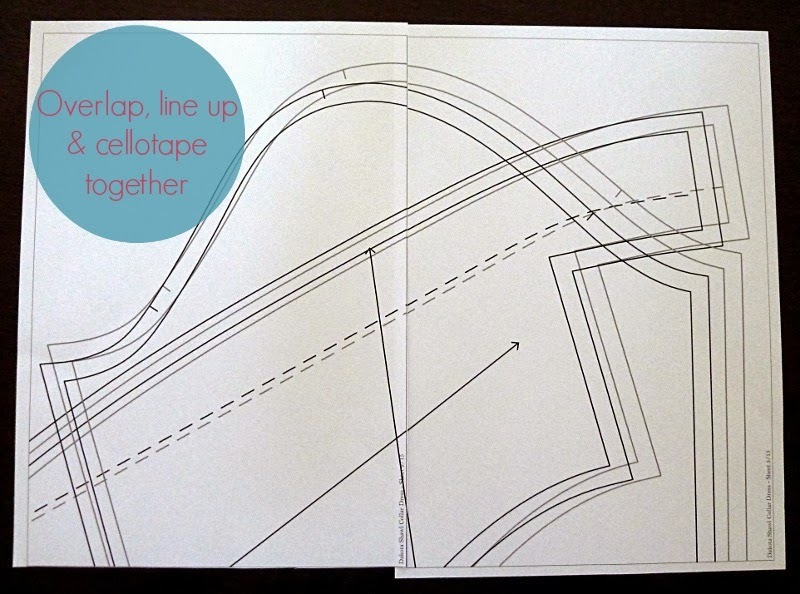 Plus, there's only two sizes to chose from, so deciphering each pattern piece isn't too hard. Named make it even easier by drawing the smaller size in black and the larger size in grey. 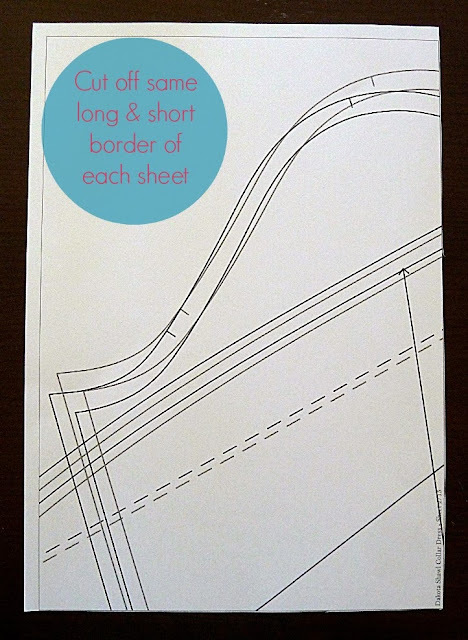 Don't be confused by the double lines for each size – the outer line denotes the cutting line and the inner line helpfully denotes the 1 cm seam allowance, which you can chose to ignore or trace off and transfer onto your fabric to make sewing super easy. If this is already sounding confusing, why not go over either of the lines in a different colour pen before tracing your pattern pieces? I'm sure you'll all have your preferred method for tracing, but I like to keep it cheap and simple. I use baking paper (beware of the greaseproof stuff as it doesn't like marker/felt tip pens very much) and tinned food as weights. Make sure you trace off all markings (notches, fold lines, darts and dart centre lines, etc) and label your pattern pieces to eliminate head-scratching moments later on. Something important to note: As of today (12 November 2013) you can ignore the following as the lovely Named girls have amended their pattern. However, if you have an older copy of the Dakota, note that the skirt pattern pieces are labelled incorrectly. Skirt front and skirt front side are the wrong way around and the same goes for the back pieces. It's not a huge problem, but something to be aware of. At this point, it's a good idea to add a few more notches to help you at the sewing stage. Although the front and back of the sleeve is easily determined by the placket placement, to help you in the heat of the sleeve-setting moment, I would add a second notch to the back sleeve head and the back armhole. I've shown the existing notches in black and added the new ones in red so you can see what I mean. I also added some more notches to the skirt pieces as it could be daunting telling the eight pattern pieces apart! Again, I've shown the existing notches in black and added my suggested new ones in red. I hope you've found this post helpful and are excited to crack on with your Dakotas...any questions just shout. Rachel and I will do our best to get back to you asap! Anyone without access to A4 paper can also chose "tile large pages" from the acrobat print screen, just keep scaling at 100%. This uses twice as much paper but allowed me to print as soon as I received my email. 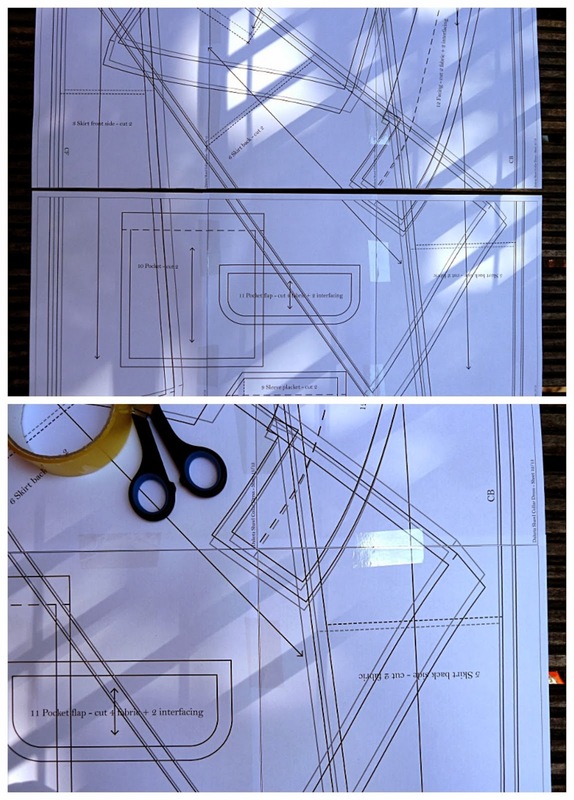 The second notch idea was indeed helpful - i'll be grateful for it when I start sewing it together. I also liked the idea of tracing the lines on the pattern in color before actually tracing the pattern as the gray and black lines were too subtle for me. I didn't have an issue with the pattern pieces being mislabeled, but then I'm using the size 42/44 patterns so it might not be the same as yours. Oh good, I'm so glad this has been helpful! And yes, maybe it's just the 38/40 size that was misprinted, but the lovely Named girls have fixed that now too! Oh wait, you're right - mine were flipped as well, anyway, doesn't matter, i've relabeled them! time to start sewing! Thanks for the tip on the skirt pieces, I'm sure I would have spent an embarrassingly long time trying to figure out what was going on! May I ask, did you find any sizing/ease issues with Named patterns? Now, in terms of sizing, keep in mind that the Dakota dress isn't supposed to be fitted at the waist. Saying that though, I'm making a size 40 which is very close to my measurements and apart from my minor alterations here (http://bit.ly/1hC6Eb2) I'm finding it a great fit. I don't think there's a lot of ease in it, because the waist isn't massive, but it will allow me to comfortably wear something underneath etc. Does this help? Hi Marie! 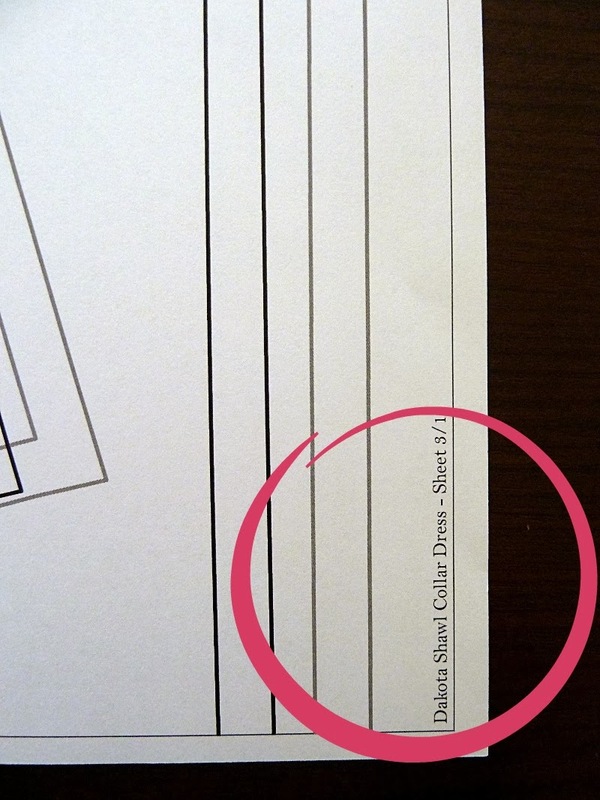 I was reading your post, and about the skirt pattern pieces being named incorrectly - I checked right away, and oh no, you were right! I have corrected them now, our apologies to everyone who this might have confused! Anyways, if you are ordering as of now, the pattern pieces will be labeled correctly. Thanks so much Laura, I meant to email you about it and didn't get around to it! I will amend my post to reflect this change now...thanks for all your support on the sewalong!